VATICAN CITY, ITALY (Associated Press) — Pope Francis today took the unprecedented step of canonizing a fictional character: Gollum, the twisted, distorted former hobbit from The Lord of the Rings, who betrayed Frodo Baggins many times before ultimately leading him to the cracks of doom so that he could fulfill his mission. Gollum will now be known as St. Smeagol the Innocent. 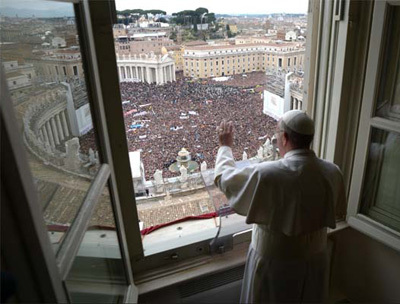 An estimated 4.6 million of the faithful gathered in St. Peter’s Square, where they witnessed the solemn and rarely-performed Mass of Canonization, which was photographed by approximately 3,000 professional photographers and paparazzi from every country in the world, all of whom were prohibited from using Nikon cameras. A sign language translator standing on the Papal balcony translated for the massive crowd, believed to be the largest in Vatican history. But investigators who watched the video later determined that he was doing the Hand Jive. The spokesman said over the past 7,124 years since the action in The Hobbit commences, hundreds of miracles had been attributed to Gollum, also known as Smeagol, including initially finding the One Ring at the bottom of a river against all odds, surviving on fish that he caught with his bare hands and the fact that Bilbo Baggins got lost and miraculously found the ring. 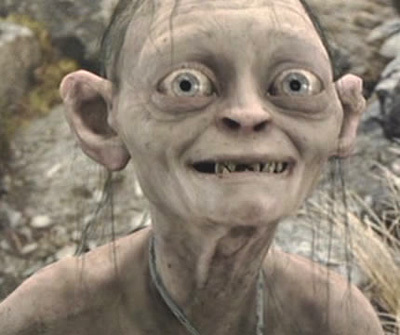 Gollum is also credited with the miracle of leading the hobbits into Sheelob’s Lair, where Frodo nearly had his blood sucked out of his body by a giant spider. The final miracle is when Gollum bites off Frodo’s finger and tumbled with the ring into the Cracks of Doom, saving the whole world from destruction. Pope Francis canonized St. Smeagol before a record crowd in St. Peter’s Square. Everyone thought it was really cool that he named a character from Lord of the Rings to be a saint. Apparently, another miracle occurred the morning of the ceremony, when Pope Francis could not find his papal ring. The entire Vatican was searched by Blackwater Security, though the ring was found by a nun about an hour later in the pocket of the former Pope Benedict, who just grinned. Pope Francis dispatched a thousand of the Swiss Guard out on horseback to the former site of Mordor and come back with Smeagol’s remains. His relics will be buried in the Vatican basement, where countless millions of the faithful are expected to visit each year, purchase tee shirts and refreshments and pay homage to one who will be known as Saint Smeagol the Innocent. In a technical maneuver, Pope Francis also posthumously declared Smeagol Roman Catholic, baptized him and gave him first communion, and also retroactively named Gandalf archbishop of Middle Earth. While the audience of the faithful was gathered in the square, a fleet of trucks from a company called Iron Mountain was seen by one reporter who miraculously got lost on the way to the event.